Aiding in the Prevention of Child Abuse, Locally and Nationally!! Any Donation will be greatly appreciated and will change the life of an abused child! 2018 Tournament is March 2-4th! Gold Sponsor: Football Field Sponsor-$500. Kappa Delta will name one of the three fields after the sponsoring company. A large banner with the sponsoring business will be displayed at the football field, directing the participants and fans to your field. 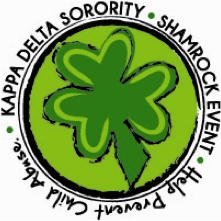 Your business will also have a large logo on the back of our annual shamrock t-shirt and will be displayed on the event brackets distributed during the event. Silver Sponsor: $300. Your business will be recognized with a large logo on the back of the annual shamrock t-shirt. Your company will be displayed on the brackets distributed during the event. Bronze Sponsor: $100. Your business name will be on the back of the annual shamrock t-shirt. Team Sponsor: Sign up your team (up to 14 people) for $200 for our single-elimination flag football tournament. The team name will be on the back of the annual shamrock t-shirt. Your donation is not just an investment in America’s Future- it is also an opportunity for you to raise your profile on campus and within the Lowndes Community. We gladly accept donations of any amount and please remember that every penny donated will go to preventing child abuse. Every little bit helps and allows us to make a larger contribution to preventing child abuse. Your donation could affect so many lives in such a positive way!